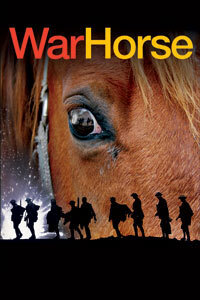 I went to see this film a couple of weeks ago (brief review: it’s a two paper hankie job) and I wondered which Knight’s horse best represented Joey, the thoroughbred who learns to plough. Do we consider the attitude of the Knights’ steeds when we consider the Knights? 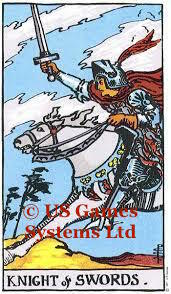 What does the horse represent in the Tarot Court? The speed at which the Knight travels in his element? An extension of the Knight himself? 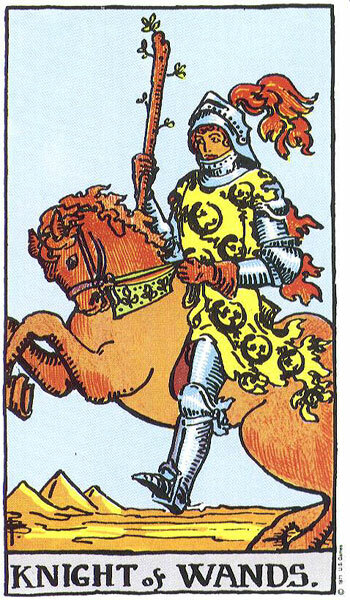 The Knight of Wands thunders joyously over the turf, followed by the slightly spooked looking Knight of Swords. 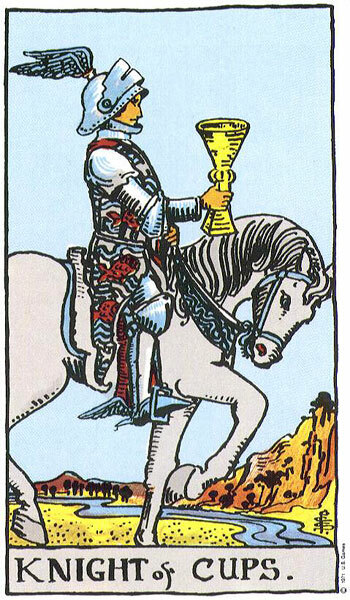 The Knight of Cups, on the other hand, proceeds at a leisurely pace and the Knight of Pentacles? He’s stopped for a sandwich and a bit of a gaze at the countryside. 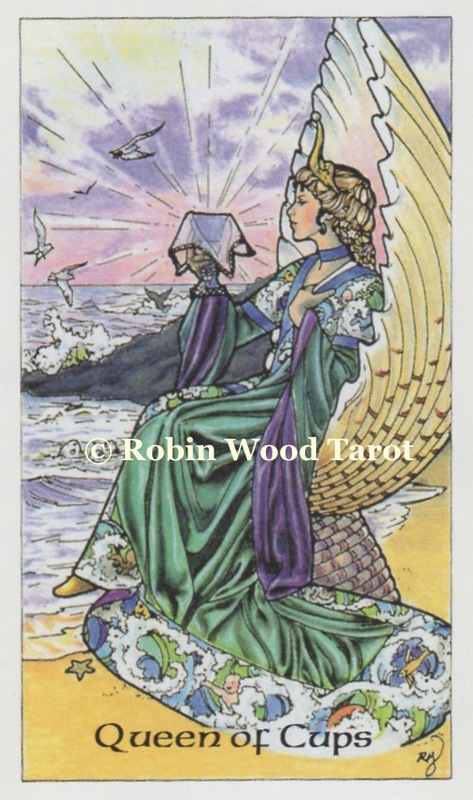 I recall someone in the TABI Training course saying that the Knight of Wands would be the first into battle, but the Knight of Pentacles would be the last out. That’s pretty much about the size of it! 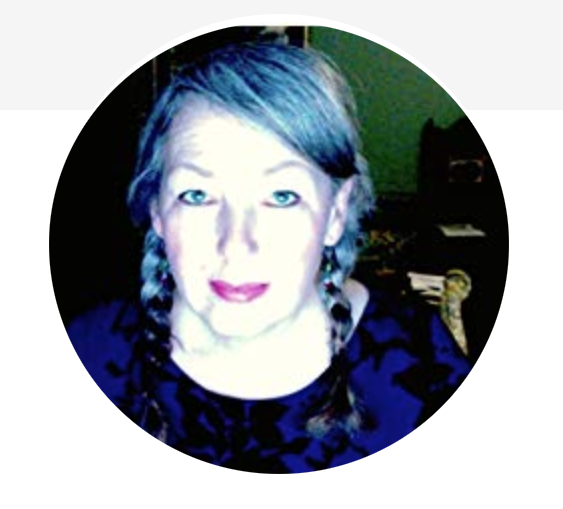 Wands and Swords both have their weapons drawn and are clearly in attack mode – how does that affect how you interpret them in a reading? Poor Joey spends most of the film in either Wands or Swords mode, but he begins the film (I won’t talk about the end in case you haven’t seen it) in the Cups and Pentacle-tastic delights of pre war Devon – a sepia-coloured vision of picturesque villages, cobbled streets, the patriotic cheering of people who have no idea about the horror about to befall the young men who march off, waving gaily behind them. It’s an adventure. And we’ll be home by Christmas. For the Knights life is an adventure and they are associated with that questing, knightly spirit when they appear in a reading. Their poor warhorses have to go wherever their masters spur them. In your own favourite deck, does the Knight’s horse reflect the Knight’s personality? Does the horse’s livery reflect the suit’s qualities? Not all Knights are on horses – other creatures are used – do the other animals chosen reflect the Knight’s suit, or has it been chosen arbitrarily? 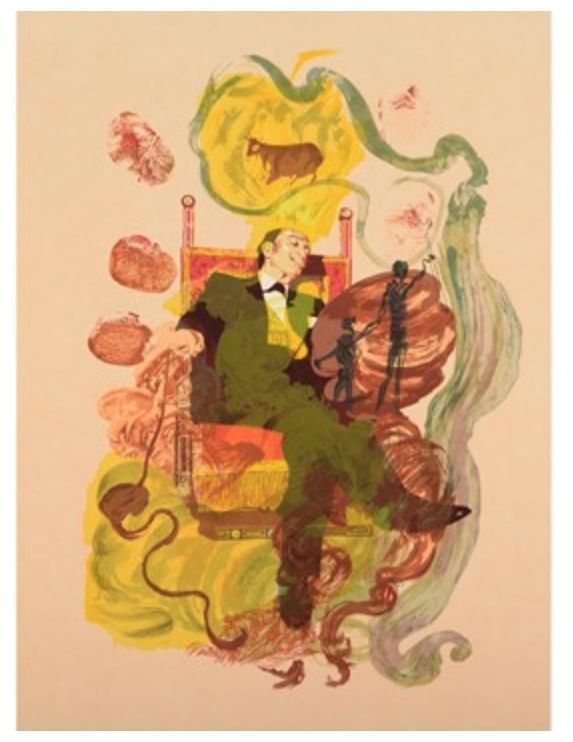 I have always thought of the courts – and the suits – as a progression – we start out Cups – pure and naive, life hurts so we get Swordy and learn to be defensive, then we figure out how to move forward – Wands – and they all culminate/converge in the Coins – mind, body, spirit working together. Really like your summary progression, Cheryl! I'm always thinking movement with the Knights (although the Pentacles guy seems to go at a walk). I'm currently trying to decide if I like the Wildwood interpretation of the Court cards, where each one is an animal. In the knights, there's a Hawk (arrows/swords), a Fox (bows/wands), a Horse (stones/pentacles), and an Eel (vessels/cups). I sort of like the traditional symbols, but the swift movement is still there in all these animals, with each one appropriate to the element they represent (fire, air, earth, water). It's just a little weird not seeing a human face. Interesting. I feel that the Knights would select horses that reflect their own spirit/personality. 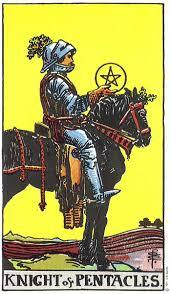 You can't imagine Pentacles sitting on the Wands horse. I think so too. In my imaginary world, all the Wands horses are like the Knight of Wands' horse etc. Yet Joey, the thoroughbred in the film, learned to pull a plough – very Pentacly activity – and it was this ability to plough that saved his life.